Energy-efficient Advance CS7000 doubles operating run time while virtually eliminating 98 percent of high-maintenance hydraulic systems. 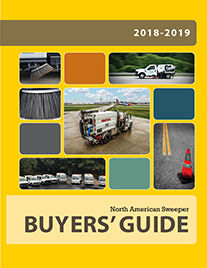 Advance, a brand of Nilfisk-Advance, Inc. based out of Plymouth, Minnesota, introduced the CS7000 sweeper-scrubbers in early May. The sweeper-scrubbers deliver unprecedented performance, fuel efficiency and operational range on one sustainable platform. 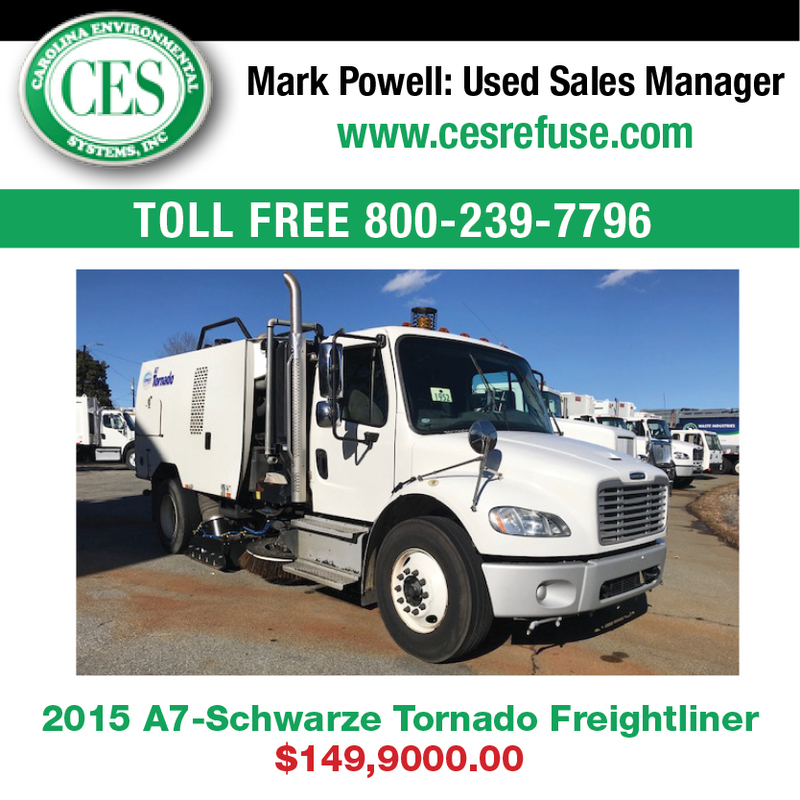 Using efficient hybrid drive or extended run-time battery powered configurations, the CS7000 largely eliminates complex, high-maintenance hydraulic systems of traditional ride-on cleaning equipment. 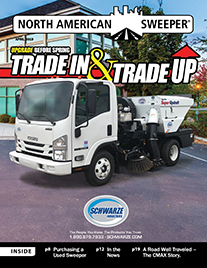 Advance offers three models built on the innovative CS7000 high-efficiency electric drive system, with two Hybrid drive models and one ePower™ battery model available to meet diverse cleaning application requirements. • Up to 50 percent less fuel consumption significantly reduces harmful carbon dioxide (CO2) emissions and minimizes high fuel costs. • Lower operating noise than similar engine powered machines provides minimal intrusive operation within facilities. • Hybrid system battery power allows users to drive to refueling station if machine runs out of fuel during operation, minimizing lost productivity particularly in large operations. 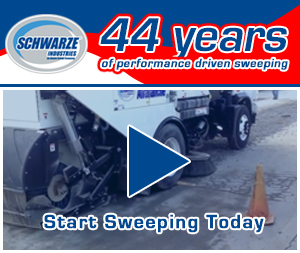 • Extended run time of up to 5.4-hours sweeping and scrubbing on a single battery charge versus traditional 3.5-hour run times on competing machines. • Cleaning performance equal to similar engine powered machines. • Zero emissions increase indoor air quality. 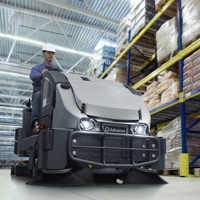 The CS7000 sweeper-scrubber operates with reliable IP55 washdown-rated, electronically-controlled electric drives and propulsion, offering simplified operation and maintenance. Compared to competitive dual cylindrical sweeper-scrubber designs, the CS7000 utilizes a cylindrical sweeping system and a separate disc scrubbing system. Dedicated sweeping and scrubbing functions with one-pass cleaning power keep dry debris dry without introducing scrub solution into the debris hopper. This provides operators and equipment owners with increased productivity and reduced maintenance. Optional equipment features provide users with unlimited flexibility to meet their cleaning challenges. The patented DustGuard™ System suppresses dust at its source during sweeping, reducing dust generated by side brooms by up to 75 – 85 percent. Combined with the patented, high capacity Donaldson PowerCore® ultra-web nanofiber filtration technology, the CS7000 improves dust control further by eliminating clogged filters. Users can also employ the optional EcoFlex™ System, which puts flexible, cost-effective cleaning power at their fingertips with one touch control, green cleaning capabilities. The CS7000 is ideal for industrial cleaning applications that present difficult-to-manage areas due to the size and scope of the required cleaning area, including warehouse, shipping and manufacturing facilities. Outdoor cleaning applications, such as heavily-accessed university grounds or large parking lots, also benefit from the CS7000’s dual cleaning capabilities.